We were, perhaps, a little ambitious with our farmer's market purchases on Saturday knowing that we were on the brink of leaving the country. Normally the purchase of such wonderful produce would spur a trip elsewhere to procure ingredients for elaborate use. However, our imminent departure demanded that we use the few ingredients we got with only the ingredients we already had on hand. One of the items we purchased were pimientos de Padrón. These are little heirloom peppers which are grown in Padrón, Spain. Luckily they are so fantastic that they require a minimal amount of fuss. Since we were low on fuss supplies this worked out quite well. I threw them in a hot pan with a little olive oil, salt, and when they were lightly browned I grated a little lemon zest over them. These particular peppers were not grown in Padrón but rather in upstate New York. 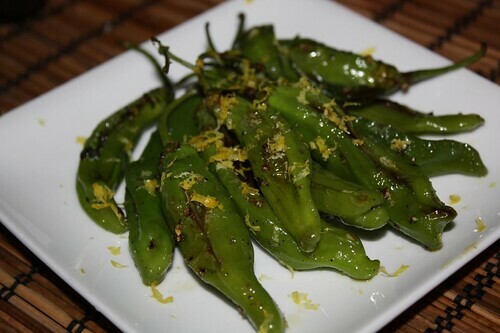 However, one thing I discovered after further investigation was that I mistook the pimientos de Padrón for the Shishito peppers we'd also purchased. So, these are actually Shishito peppers which, for the record, are quite good being cooked in this method. Perhaps later this week we will be able to enjoy the pimientos de Padrón with the full awareness of what we are actually doing. The thing about peppers is that they all look very similar. 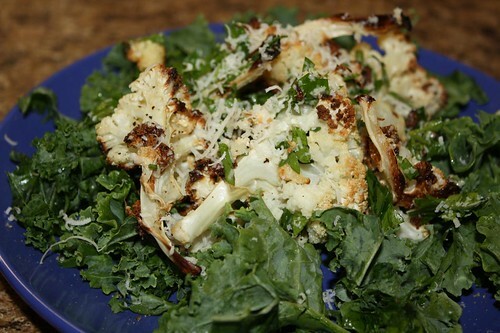 For a salad I roasted the remainder of our local New York cauliflower, tossed it in olive oil, lemon juice, Piave, salt, pepper, and parsley and served it over some torn kale leaves. This is a pretty traditional way of doing cauliflower in Italy (more specifically Sicily) if you forget about the fact that they don't use a lot of kale in Italian cooking. 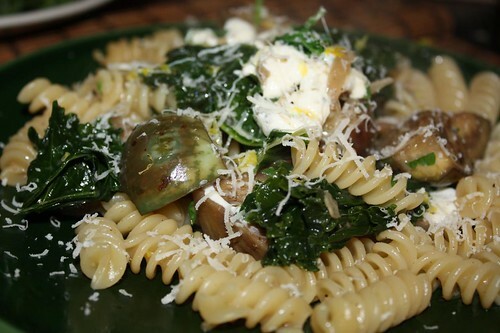 For the main course I used some India Paint eggplant, Rosa Bianca eggplant, red onion, garlic, kale, chicken stock, mozzarella, and Piave, with fusilli. And there you have it, an inexpert use of a fantastic farmer's market haul. Perhaps the next time we go to the market we will stay in the country for more than a few days.